Trump talks about trade in America and says he wants to stop companies from opening factories overseas. Trump claims that recent trade deals have resulted in the loss of thousands of factories to China that would have been originally built in the U.S. Trump says his administration will “protect religous liberties.” The President-elect also touched on the importance of the Supreme Court and the justices he nominates will protect the ideals held by his supporters. Trump asks the crowd, “To never, ever give up.” He added that he should have given up several times during the campaign, but he never did and was victorious. Trump says, “We are going to Make America Great Again.” The President-elect has left the stage at Ladd-Peebles Stadium to the Rolling Stones song, “Can’t Always Get What You Want.” Trump said. “The safety of the American people will always be the priority in the Trump administration,” says Trump. “I’m going to keep radical Islamic terrorists the hell out of our country,” Trump added. The President-elect says that his administration is going use “extreme vetting”. Trump says his administration will “protect religous liberties.” The President-elect also touched on the importance of the Supreme Court and the justices he nominates will protect the ideals held by his supporters, including all Evangelical and Republican value. Trump asks the crowd, “To never, ever give up.” He added that he should have given up several times during the campaign, but he never did and was victorious. “The safety of the American people will always be the priority in the Trump administration,” says Trump. “I’m going to keep radical Islamic terrorists the hell out of our country,” Trump added. The President-elect says that his administration is going use “extreme vetting”. UPDATE (4:35 p.m.) – Trump talks about trade in America and says he wants to stop companies from opening factories overseas. He added that Sen. Jeff Sessions will be the one to catch and prosecute companies that break the law. Sessions was nominated by Trump for the position of Attorney General. His confirmation hearings will be in January before the U.S. Senate. Trump claims that recent trade deals have resulted in the loss of thousands of factories to China that would have been originally built in the U.S.
UPDATE (4:30 p.m.) – President-elect Donald Trump is testing different catchphrases for his presidency and getting the crowd to vote on each phrase by cheering. The phrases were “Made in the USA” versus “Made in America”. Both received large cheers from the crowd. Trump is also talking about his recent magazine cover on Time where they named him, “Person of the Year”. He is getting the crowd to vote by cheering on the different phrases for the magazine. Trump wanted the cover to say to “Man of the Year”. The crowd overwhelming supported the “Man of the Year” statement. The President-elect is talking about trade deals and saying that all the deals are behind them. He added that his administration will take care of the American worker. Trumps says the business tax rate will go down to 15-percent from 35-percent when he takes office. UPDATE (4:15 p.m.) – Trump continues to talk about the campaign that led to his victory. The President-elect says that he is happy that his campaign spent less money and still won. “When you spend less money and win, that’s much better than the other way,” Trump said. He continues to go state by state about his victory and rattling off the numbers. UPDATE (4:10 p.m.) – Trump says the exit polls released on Election Day by media companies were used to depress the vote in western states where voters had not made it to the polls yet. Trump also praised the electoral process that led to his victory. His opponent, Hillary Clinton, won the popular vote, but Trump had a commanding lead in the electoral college where he had over 300 votes. Trump only needed 270 to win the presidency. UPDATE (4:05 p.m.) – President-elect Trump continues to insult the media and adds again that the media is “very dishonest”. Trump brought out his campaign manager Kellyanne Conway and added that she is the first female to run a winning presidential campaign. UPDATE (4 p.m.) – President-elect Trump talks about his improbable win and makes jokes about the media being against his campaign. Trump also talked about the size of the crowds at his rallies during his campaign. He added that the media has been “very dishonest” about reporting the size of the crowd at his rallies. News Five estimates that the crowd at Ladd-Peebles Stadium is near 10,000 attendees. 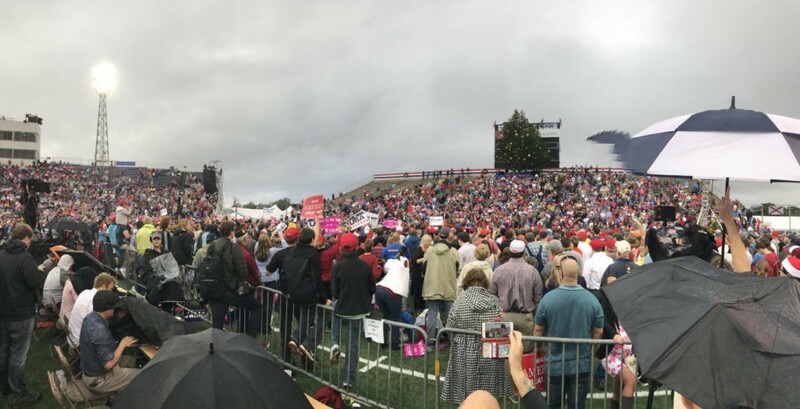 UPDATE (3:50 p.m.) – Alabama Senator Jeff Sessions takes the stage to join Trump at Ladd-Peebles Stadium and put on a white “Make America Great Again” hat. “It is great to have you back in my hometown Mobile, Alabama,” said Sen. Sessions and he also talked about the rally in 2015 that helped kick-off the Trump campaign. Sen. Sessions was the first senator to officially endorse Trump during the campaign. UPDATE (3:47 p.m.) – Trump says, “We are going to build the wall.” The comment came after the crowd at Ladd-Peebles Stadium chanted about building the wall. The president-elect also spoke about the purchase of a new Air Force One and says the country cannot be wasting money on these type of purchases. UPDATE (3:45 p.m.) – President-elect Trump talks about the reasons behind his victory. He thanked Evangelicals and in particular Reverand Bill Graham, who spoke to the crowd before Trump took the stage. UPDATE (3:40 p.m.) – President-elect Donald Trump has taken the stage at Ladd-Peebles Stadium. He walked onto the stage as Lynyrd Skynyrd’s ‘Sweet Home Alabama’ played in the background. “This is where is it all began,” Trump said as he took the stage. UPDATE (3:30 p.m.) – Trump’s campaign manager Kellyanne Conway has taken the stage at Ladd-Peebles Stadium. She is getting the crowd ready to go before the President-elect takes the stage. “I will not be told who can win and who cannot win,” said Conway to the crowd in Mobile, Ala.
President-elect Donald Trump is in Mobile, Ala. in the last stop of his ‘Thank You’ Rally across the United States. Trump defeated Hillary Clinton last November in the presidential race and will assume the office of President in January 2017. However, this is not Trump’s first stop in the Port City. Trump and his campaign held a rally in 2015 at Ladd-Peebles Stadium, the same location as the rally Saturday, that helped kick off his campaign during the Republican primary. News Five is broadcasting the event live over the air and our website. Updates will be provided throughout the rally. The mayor of Mobile, Alabama is apologizing for having a tree cut down before President-Elect Donald Trump's visit to the city this past Saturday. The tree was removed from Public Safety Memorial Park and then taken to Ladd-Peebles Stadium where it was used as a decoration during the Trump event. The mayor's chief of staff says he was the one who made the decision to cut down the tree. He has apologized and says he will personally pay for three trees to be planted in the park where the tree was cut down. The poor guy just wanted to Make America Great Again - I will cut down my own tree in honor of the Christmas spirit. Were going to start doing things the American way!